Tobins' Tastes: Couponing for Water? 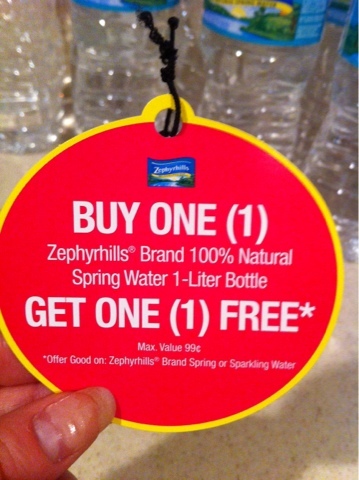 When I went into Publix earlier this week to take advantage of the Summer Savings ConAgra rebate, I noticed a pretty amazing deal on Zephyrhills liter water bottles. These bottles regularly retail for .99 cents at Publix but they were on sale for .80 cents each right now. There were also lots of B1G1 free manufacturer hang tags on the bottles as well making them .40 cents each after sale and coupon. I decided to try and create a senario where I could also use a $5/$30 coupon to make the deal even better. Since I have two Publix's directly on my way home, I figured I would swing by on my way home from work to see if I could easily grab the deal before the hang tags all disappeared. I was so happy to find the Publix closest to my house very well stocked for the deal. I know that most people would think that the act of buying bottle water defeats the purpose of trying to save money and be frugal. I would normally agree with that and we use a Brita filter and usually fill our own bottles and cups at home but since we live in South Florida and hurricane season is upon us, I needed to stock up on bottle water just in case and this deal turned out to be the perfect way to do it. Here is the coupon I was able to find in more than one of my local stores. 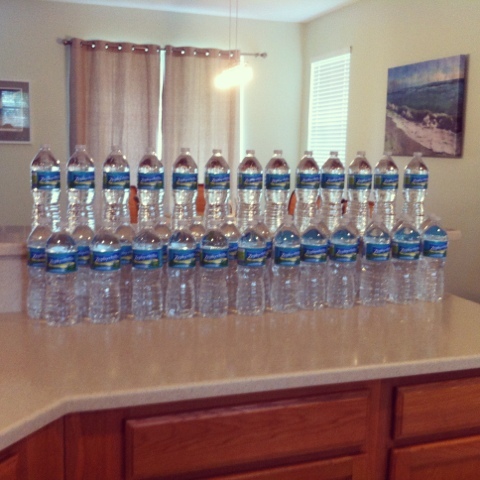 In years past, I have stocked up on the large multi gallon bottles before hurricane season and then when the season was over we tried to use them up as we could. However, since we use a water filter in our house I would always forget to use them. This deal is great because once hurricane season is over we can bring these bottles with us to the beach or on a picnic or trip without them being too bulky. I had a great experience today at my local Publix because they were more than well stocked on the water so I didn't have a problem finding 38 bottles or feel guilty about buying too many. I was able to find plenty of bottles with the hang tag and I even had a few employees each offer to get more hang tags from the back for me if I needed them. That is why I love shopping at Publix : ) Make sure you check out my Publix Coupon Pack giveaway! Make sure you come back on Thursday to link up your weekly totals shopping trips! Please see Earth 911 or Life Without Plastic. Single use plastic is so bad for the environment and is not sustainable. Please consider a refillable container.